If you live in Sparta or the surrounding area and need a trusted veterinarian to care for your pets – look no further. Our doctors are licensed WI veterinarians, treating all types of pets. Your pets’ health and wellbeing are very important to us, and we take every possible measure to give your animals the care they deserve. Sparta Small Animal Veterinary Clinic is a full-service animal hospital and welcomes both emergency treatment cases as well as pet patients in need of routine medical, surgical, and dental care. Our doctors have years of experience treating serious conditions and offering regular pet wellness care. Beyond first-rate pet care, we make our clinic comfortable, kid-friendly, and calm, so your pet can relax in the waiting room and look forward to meeting our veterinary team. We are happy to offer a number of resources that enable you to learn about how to take better care of your pets. Please feel free to browse our site, particularly the informational articles. The best veterinary care for animals is ongoing nutrition and problem prevention, so becoming knowledgeable about preventative pet care is essential to the ongoing success of your animal’s health. If you have any questions, call (608) 269-8234 or email us and we'll promptly get back to you. All telephone calls are recorded for quality control and training purposes. Our Sparta veterinarian office is very easy to get to -- just check out the map below! We also welcome you to subscribe to our newsletter, which is created especially for Sparta pet owners. At Sparta Small Animal Veterinary Clinic, we treat your pets like the valued family members they are. Call or send us an email today! Our staff will respond as soon as possible. If you have an urgent issue, please call the office. All telephone calls are recorded for quality control and training purposes. We will do our best to accommodate your busy schedule. Request a non-urgent appointment today! If you have an urgent issue, please call the office. Sparta Small Animal Veterinary Clinic is a proud veterinary partner of Pets for Patriots, a nationally operating 501(c)(3) charity saving lives through companion pet adoption for United States veterans. Click to learn more! Karen is a 1997 graduate of the University of Minnesota with a degree in Veterinary Medicine. Randy is a 1997 graduate of the University of Minnesota with a degree in Veterinary Medicine. Jana strives to ensure that our clients and patients have all of their needs met. Becky graduated from the Madison Area Technical College in 2003 with a degree in Veterinary Technology and received her Certification in Animal Massage from the Healing Oasis Wellness Center in 2007. Beth graduated from the Madison Area Technical College in May 2015 with a degree in Veterinary Technology. Nicole graduated from M.A.T.C. in 2012 with an A.A.S. in Veterinary Technology. She worked in the large animal field before taking the plunge into small animals! Chelsea joined our Team eager to make a difference in both client's and patient's lives. Jen joined our clinic new to veterinary medicine but with a lifelong love of animals. Kiara worked her way through high school with us as a kennel assistant. Her senior year she became a veterinary assistant and continues to work with us while in college. Ashley is a Senior at Cashton High School. She lives on a dairy farm with her grandparents, parents, and brother. "Dr. Randy at Sparta Vet Clinic has always been amazing to us and our dogs. They took so much care for us all as we put 2 of our dogs down over the couple years and now helping us navigate with our Chester and his allergies. Tonight Dr. Randy called me at 6:50pm and we talked about medicine options for the pup for 15 minutes. I didn’t ask him to call me back when I spoke with his front staff and certainly never expected a call after hours. He certainly cares about his 4 legged patients and the paying customers (aka the pet owners). I highly recommend them for any of your pet needs. We drive 30 minutes one way but it is so worth it!" "Probably the best vet clinic I've ever taken my pets to. The staff are all caring and professional, the pricing is extremely fair, and they do not try to push for sales of "extras". Both doctors are very personable and all staff seem to actually care about each individual animal." "Our Sai had to make an emergency trip after we came home from work and found him very sick. Dr. Randy was calm and caring and very knowledgeable. He came in to the office immediately after getting off the phone with me and took care of our little man. Turns out he had bronchitis. But the staff were super friendly and reasonably priced for an ER visit, x rays, and medicine, along with a few hour stay at the clinic. Thanks guys!" 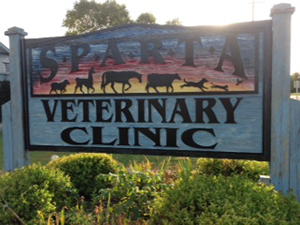 "Sparta Vet Clinic is such an affordable Vet Clinic. Drs. Randy and Karen along with their staff are so compassionate, knowledgeable, and treat all your fur kids like their own. From kitten and puppy age until the end of life. Dr. Randy really goes in depth when it is needed and always discusses all options, even the hard ones that no one wants to make." "Being in the Animal field for almost 20 years, I have not only worked in Veterinary Clinic, but have had lots of experience dealing them... VERY impressed with everyone. I truly appreciate the amazing customer service..AND knowing that in the case of an ER, I have access to a Dr. 24 /7 is very comforting. Keep up the good work!!" "Not only is Dr. Randy and his staff the primary care staff for our animal shelter, but they've recently become the primary care for my own animals. After a couple of bad experiences at our previous vet, there was no doubt in my mind that Sparta Vet would be where we were happiest. The front desk staff are courteous and friendly, and they greet my animals immediately. Dr. Randy is educational, straight forward, honest and goes above and beyond for my animals. He never tries to up sell services they don't need, and their wellness is his number one concern. I know my babies are in the best hands with this team of caring professionals!" "All the staff truly care about the animals that they see and are respectful of the owners. The Vets are exceptionally skilled, knowledgeable and obviously love all the animals they take care of. Several years ago Dr. Randy saved my old Golden Retriever's life by his quick action in diagnosis and abdominal surgery. Not too many people would come in on their day off to do that. They have taken care of my dogs from puppyhood to old age and euthanasia when necessary. They are The Best!" "Very friendly, courteous and very knowledgeable staff and veterinarians that really care about your pet and their health. Their respect and kindness for your pet is apparent the minute you walk through the door. I really appreciate the professionalism and caring they have shown us and would recommend them highly." "They are awesome ,took us in a emergency situation cause iron was hurting so bad in his ears ,and momma could not make it better , by the end of visit, he was feeling better and within couple days his puppy ears were back flopping as he ran. I love this place 😁"
"All of the veterinarians and certified veterinary technicians are very professional and competent. Dr. Randy, in particular is able to deal with my very anxious and combative German Shepherd. He never shies away from the challenges he presents.."
"Extremely friendly staff. I live in West Salem, so it is actually out of my way to go there. I have never had to wait long for an appointment. When my dog was sick, they called a few days later to check on him. Highly recommend them!" "Best vet in the area. I drive all the way from La Crosse to see Dr. Randy. Very good with my dogs and also financially responsible. There is no one better for our babies!" "Love Dr. Shea & the techs who have helped with our husky pup! She loves going to the vet!! Huge fan of the appointment reminders via text message! Keep up the great work!" "So happy we chose these guys for our animal care. They went above and beyond and saved our dog's life. My family is forever grateful!!!" "Sparta Vet Clinic is THE BEST! Love taking my kittens to Randy and Karen for the absolute best in care!"